Sinoma (Yichang) Energy Conservation New Material Co., Ltd., a member unit of China National Building Material Group Co., Ltd. and a Holding Co., Ltd. subordinate to Sinoma Energy Conservation Ltd. (stock code: 603126), is a large enterprise specialized in research and development, production and sales of high-end calcium silicate board/fiber cement substrate, multifunction and multispecies painting plate, integrated composite external wall insulation and decoration board and light composite external wall insulation board. Located in Guandaohe Village, Yuquan Office, Dangyang City, Hubei, the Company covers an area of 143600m2, and has building area of standard industrial factory building of 86000m2. By virtue of process technology and management experience of Wuhan Building Material Industry Design & Research Institute Co, Ltd. having proprietary intellectual property rights, the Company introduces the international leading full-automatic production process and equipment, and has annual output of high-end calcium silicate board/fiber cement substrate for 20000000m2, multifunction and multispecies painting plate for 1000000m2, integrated composite external wall insulation and decoration board for 1000000m2 and light composite external wall insulation board for 2000000m2. Sinoma high-end calcium silicate board/fiber cement substrate is energy-saving and environmentally friendly, has strong shock resistance and impact resistance, and is asbestos-free completely, and characterized with fire prevention and inflaming retarding, heat insulation, corrosion prevention and moth proofing, water resistance and moisture protection, light weight and high strength, and good weather resistance. 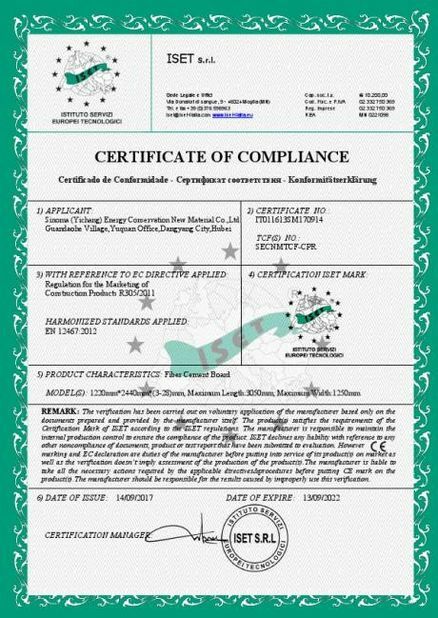 Therefore, it can be widely used in the internal and external walls insulation and decoration, ceiling, floor, advertising board, bulkhead, furniture clapboard, wall material lining plate, fire-proof plate, hollow floor, security door lining plate and multifunction painting plate substrate. 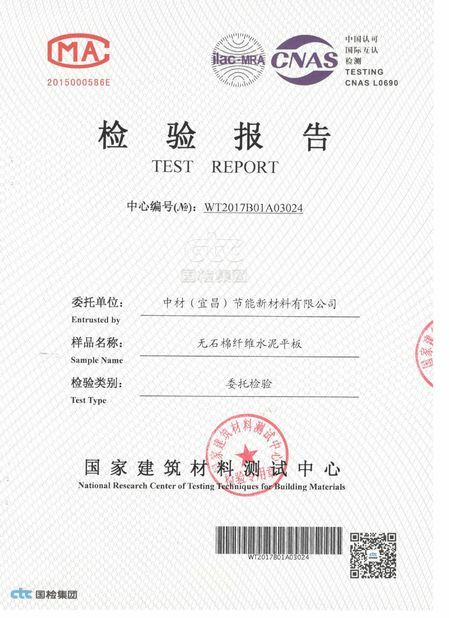 Upholding the philosophy of “Making Best Use of Resources to Serve Construction”, and vigorously carrying out such strategies as “technical innovation”, “internationalization of building materials”, and “building strength with talents”, CNBM is the largest comprehensive building materials industry group in China that integrates scientific research, manufacturing and logistics into one entity, and consists of four business platforms, i.e. industry, technology, complete set of equipment, and trading & logistics. As of the end of 2009, CNBM’s total assets exceeded RMB 110 billion, with 100,000 employees, and 20 companies under direct management with 100% share control or majority control, among which 6 were listed companies, including 2 overseas listed. Innovation is vital to maintaining our pre-eminent position in the fiber-cement industry. Consequently, we invest heavily in research and development, with a special emphasis on product quality and production efficiency to develop durable and low maintenance fiber cement board products. As a government owned company, we will provide the best quality products to our customers with the reasonable price. The Company is willing to sincerely cooperating with practitioners in relevant industries, and strives to pursue the maximum profit of energy saving and emission reduction and environmental protection capital input on the basis of achieving the social benefit and environmental benefit. Moreover, the Company is committed to becoming the influential global developer and service provider in the new material, new technology and new product fields.